Oysterman Johnny Schneider of Mereaux, La., discusses his feelings about the Deepwater Horizon oil spill being capped as he stands on his oyster boat in Hopedale, La., on Thursday. Eh, the damage is done. The oils everywhere now, Schneider said. NEW ORLEANS  Many Gulf Coast residents dont believe it. Some accuse BP of making it up. And even those convinced that the oil leak has finally been stopped are tempered in their relief, aware that their environmental nightmare is far from over. Reaction to the news that BP PLC had cut off the flow from the blown well nearly three months after an oil-rig explosion was marked with deep distrust of the oil giant. Gulf Coast residents have suffered from months of false starts and dashed hopes, failed top kills and abortive junk shots, containment domes and top hats, as they watched the biggest offshore oil spill in U.S. history foul their shores and eat into their livelihoods. Even those who believed what they were seeing on the live video feeds from the school of submersibles surrounding the damaged well head were having a hard time getting excited about this milestone. At a dock in Hopedale, La., Roy Campos crew was unloading and boxing blue crabs  their first in about a week because of closures. When they heard the news, the most the men could muster was a nod. The oils still out there, so itll be a while, said Campo, 50, of St. Bernard. Deckhand Manuel Meyer grinned, but his tone was somber. Others on the Gulf Coast do believe that their region has finally turned a corner in this creeping disaster. Its freaking wonderful, said Gary Kiger, a 39-year-old shrimper from Cutoff, La. 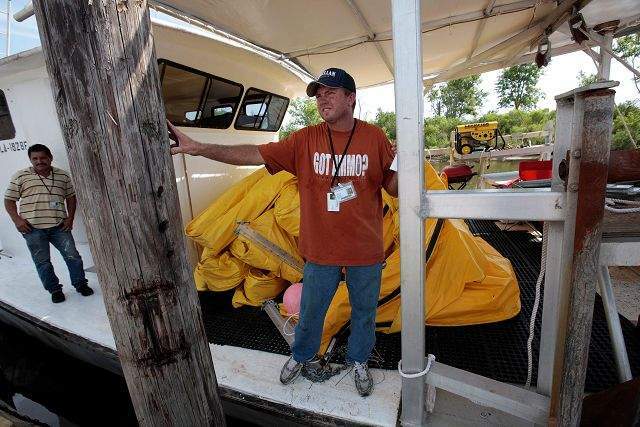 Kiger has been involved in the cleanup from the beginning, working and living on his boat out in the Gulf. Looking down a pier of trawlers loaded with boom and vacuum equipment instead of nets, Kiger said he was ready to get back to hauling shrimp. The cap placed on the blown well in the last week is only a temporary fix. BPs permanent fix, a relief well, is still days or even weeks from being completed, and a hurricane in the wrong place could set that timetable back. And lets face it: If BP CEO Tony Hayward said it was raining, most Gulf Coast residents would stick their heads out the window to check for themselves. Some of the doubts that the leak has really been stopped appear to have sprung from glitches in the live feed from the Gulf floor. Some people complained that the video went out just as the oil stopped flowing, but an Associated Press reporter in Houston was able to view live footage of the shutoff the moment it happened Thursday  2:25 p.m. CDT. For several days surrounding the cap operation, the 15 undersea camera feeds available through a link on BPs website have worked intermittently, at best. Sometimes, the feeds were hazy or hard to see. Other times, they were blank altogether. BP said feeds were lost for periods of time because it had to move the cameras and robots out of the way for some of the preparations for the well integrity test. There also has been a great demand among journalists and other viewers on the Web for a glimpse at the underwater operation. As a result, the increased number of people trying to link to the site surely caused it to freeze up from time to time. Buras bartender Amy Hooks stopped watching the feeds a long time ago.